The Hot Rod Hobbies Off-Road Shootout Flyer! That's right...the shootout is fast approaching! Don't miss this signature annual race...this year, we're going to beat the heat and hold the race indoors, at Rainman's Hobby and RC Raceway in Bakersfield! This is an awesome opportunity to rub elbows with some of the best racers in California and around the country. Particularly for the rookies who sign up for the RC Pro/Am, where they'll be partnered with a sponsored Pro Driver to receive setup tips and coaching, taking their driving to the next level! Click here to download the flyer/entry form in PDF format and be sure to get it in early. This is going to be an awesome event! As most of you probably already know, we were supposed to install a brand new layout on January 13th, but unfortunately the track was still too wet for the build. The guys were able to pull the old pipe off the track on Saturday. We have since moved the build back a couple weeks and we are going to try to do it on Saturday, January 26th. We have had rain all week, dumping 5+ inches of rain on the track. After this rain, it will take a week to pump and dry the track...meaning that the off-road track will be closed for a couple of weeks. We hope to have it open with a special track break-in practice day on Sunday, January 27th. This means no Tuesday night or Saturday night racing, this week or next. Once the track is ready we will have a brand new layout and great weather! We apologize for the inconvenience, but we hope everyone uses the time off to rebuild those cars and get ready for a great year at Hot Rod Hobbies! The hobby shop will be open as usual during this time so stop by and grab some parts or just to say hello! Broken Baby shoots music video at HRH! Back in early June, we had a production crew on the track here at Hot Rod Hobbies, shooting a music video for a band called Broken Baby and their song, "Hello From The Other Side Of Hell No." A few of our locals pitched in to help out by turning in some skillful (and not so skillful) laps! The music video has officially been released for the world to enjoy, so we are presenting it here for you to check out. Notice that the guitar player is wearing a Hot Rod Hobbies/JBRL t-shirt! 2018's Shootout champions have been crowned! Another Hot Rod Hobbies Off-Road Shootout is in the books! We wanted to thank everyone who came out for being a part of our signature race this year, we appreciate it and hope you all had a great time. A few people had a better time than everyone else, though...and here they are. If you'd like a copy of all the results of each heat in PDF form, click this link to download it. Congratulations, everyone...we hope to see you again soon! Help us install the Shootout layout on September 23rd! ATTENTION HOT ROD HOBBIES LOCALS! 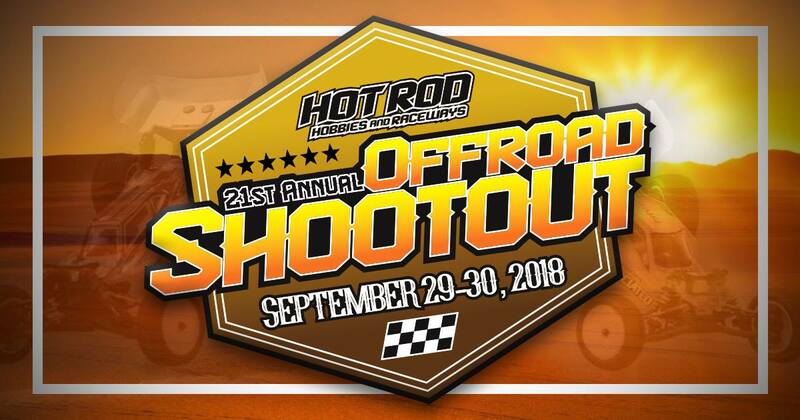 We will be installing a brand new layout at Hot Rod Hobbies on Sunday, September 23rd in preparation for the 21st Annual Hot Rod Hobbies Off-Road Shootout, taking place September 29th & 30th! Joey Wolters Christensen from The Dirt Racing will be here, making the magic happen...but as always, we desperately need your help with the build! For your efforts, you can choose between Shootout entries and a month of free first class club race entries, as usual! Because of the build, we will be racing at 12:00pm on Saturday the 22nd. We will need to pull the old pipe and Joey will get started on the track immediately after racing is over. Thank you so much for your support of Hot Rod Hobbies! Just a reminder that the Annual Hot Rod Hobbies Off-Road Shootout is coming up, during the last weekend of September! If you haven't already signed up to race, be sure to click the image above to download a printable PDF form, and either mail it in order bring it up to the shop, when you're at the track. We look forward to seeing you out there...and Rookies, don't forget about the R/C Pro-Am, which will pair you up with a pro R/C driver for help with setup and driving tips, to take your racing to the next level! 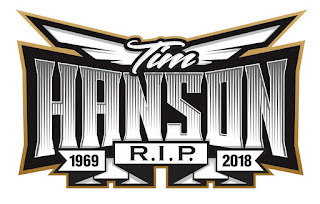 Hot Rod Hobbies and Tim Hanson's daughters thank you for your support! Congratulations to our Tim Hanson Memorial Club Race winners! It was a great day of racing and more importantly, generating money for Tim's girls! THANK YOU all for participating and donating to the cause! Track is open for practice every day until the shop closes, except race nights. The fee is $15.00/day. For our Off-Road program on track #1, your first class signup fee is $20.00 and each additional class is $10.00. For the Dirt Oval program on track #2, your first class signup fee is $20.00 and each additional class is $10.00. Happy New Year From Hot Rod Hobbies!